transported another woman to the hospital. 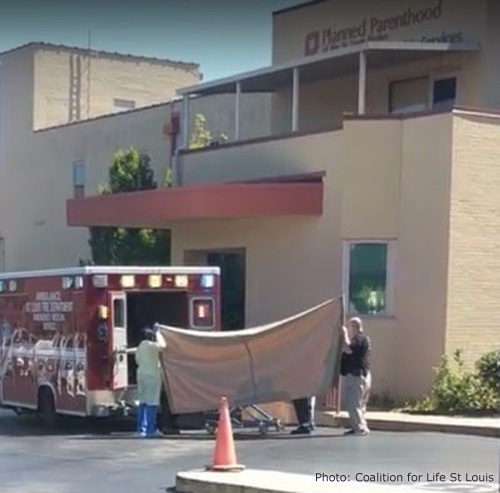 St. Louis, MO — The Coalition for Life St. Louis has reported that ambulance transported a yet another woman from Reproductive Health Services Planned Parenthood in St. Louis, the last abortion facility in Missouri. The frequent string of medical emergencies there have earned the RHS Planned Parenthood the dubious distinction as the Most Dangerous Abortion Facility in America. According to Brian Westbrook, the Coalition for Life’s Executive Director, members of his group observed an ambulance running with lights and sirens that arrived at Reproductive Health Services Planned Parenthood in St. Louis at approximately 10:45 a.m. on August 4, 2017. About ten minutes later, emergency responders exited the abortion facility with a woman on a gurney, who was covered in a white sheet. Other employees attempted to block the gurney from view of pro-life activists with the same tan tarp they have used during many previous patient emergencies. The ambulance later rushed away from the Planned Parenthood property with lights flashing and sirens blaring. Operation Rescue, which tracks medical emergencies at abortion facilities nationwide, has documented 67 patient-related medical emergencies at the St. Louis Planned Parenthood facility since 2009. The most common complication suffered by women there is hemorrhaging— a life-threatening condition that Planned Parenthood is not equipped to treat. Deficient infection control measures, dirty facility conditions, expired medications and supplies, failure to properly sterilize surgical utensils, and poorly maintained equipment are just a few of the violations cited — often repeatedly — at the RHS Planned Parenthood. Most recently, a health and safety inspection report dated May 25, 2017, revealed that Planned Parenthood’s Medical Director and abortionist, David L. Eisenberg, “questioned if hand hygiene between glove changes was a new standard” and inquired of a state inspector whose standard it was. The 17-page report was filled with grim details of other unsanitary practices and conditions that exposed patients to infection and disease. In fact, the St. Louis Planned Parenthood is so dangerous that Missouri Gov. Eric R. Greitens called a Special Legislative Session this summer specifically to address safety protections for women. The result was a sweeping new law, SB5, that will ensure annual inspections of abortion facilities, and numerous other provisions designed to provide greater safeguards for women, more accountability for abortion businesses, and a better mechanism for enforcement of abortion laws.